Stay at this modern and easily accessible hotel in Gembloux situated among the natural beauty of Namur! The Best Western Hotel Les 3 Cles is conveniently located in the center of Gembloux near the L'Escaille nature reserve with easy accessibility from Motorway E411 (Brusels - Luxembourg) and E42 (Mons-Liege). Hotel guests can enjoy a multitude of sports and recreation in the hotel's immediate vicinity or set off on short excursions to the famous Citadel of Namur, the Meuse River, Bruxelles Grand Palace or the cities of Charleroi or Liege. 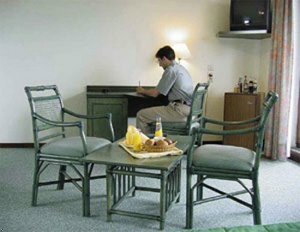 Hotel Les 3 Cles offers all the right amenities for business and pleasure. Each well appointed room provides cable satellite television with CNN, direct dial phone, refrigerator, electric trouser press, mini-bar, private balcony and fireplace. Guests will receive a complimentary full breakfast. Other amenities at this Gembloux hotel include room service, a cocktail lounge, complimentary newspaper, free parking and playground for children. For exceptional service while traveling to Gembloux make an online reservation today at the Best Western Hotel Les 3 Cles!